David Brown is a 30-year veteran of the Dallas Police Department. The average police chief in a big-city department only stays in the job for about three years. Brown has been chief for five. Now, his critics are saying that’s too long for how little they claim he’s done to protect officers and citizens. Rochelle Bilal is from Philadelphia and is vice chair of the National Black Police Association. She joined many Dallas locals on stage and said numerous complaints to the City Council, the city manager and Brown himself have gone unanswered. 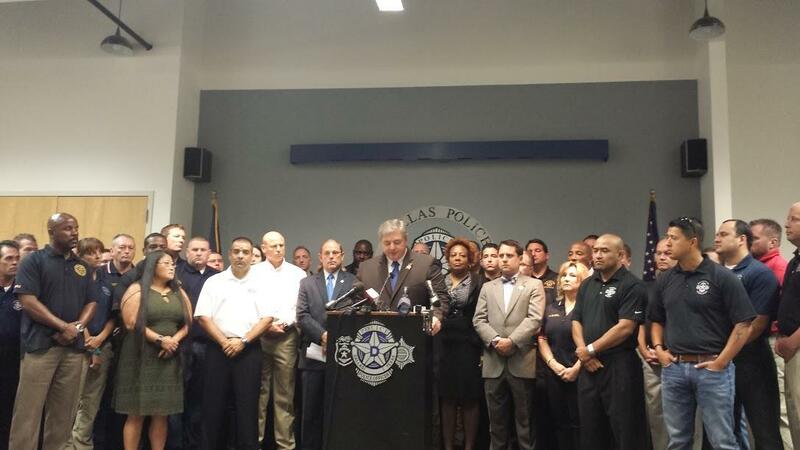 The police groups cited a recent survey from the Dallas Police Association. Three out of four cops who responded said morale was either “low” or the “lowest it’s ever been.” Meanwhile, police response times for emergency calls are getting longer -- and the police report that violent crime is up 7 percent over the past year. Dallas Police Association President Ron Pinkston points the finger at Brown. Dallas Police Association President Ron Pinkston says problems in the department are management's fault. He joins other police groups to call for better officer treatment and new leadership. In response, the police chief touted his policies, which instruct officers to slow down and be cautious when handling potentially dangerous situations. He said that approach has had results. Shootings involving police have declined and excessive force complaints have dropped 80 percent. This comes during a time of national debate about policing and proper training. On Monday, Brown addressed his critics on the City Council. While he originally downplayed the low morale as simply part of the job, he finally acknowledged that a lot of officers’ complaints are still justified. Brown has promised to work on improving pay and pension benefits for officers, which he blames for officers leaving the department over the past few years. While some critics still have faith in Brown’s determination to work things out, many at Wednesday's gathering agreed that whatever he does to appease them from now on is too little too late. Dallas Police Chief David Brown is definitely a fan of Twitter. He's active on the social media network, posting notes about basketball tournaments and answering questions from his Twitter followers. But among the updates he posts are the names of the officers and other employees he has recently fired. It all started as an effort to increase transparency. But the city’s police association is complaining about the practice. Dallas Police Chief David Brown has fired a sergeant for keeping quiet about a murder suspect. Police say that Sgt. Carlton Barnes failed to give homicide detectives information from a capital murder case in September 2011 after he recognized the suspect as a former classmate.